Disclosure: I am a WriteShop Brand Ambassador. All thoughts, opinions, and ideas are my own. 1. Create a Writing Center. One of the first things WriteShop Primary has you do is to create a “command center” of sorts for your child’s writing. This is a fabulous idea for writers of all ages! Regardless of what kind of room you use for school, you can create a writing center. Since we school a variety of places in our house as opposed to one particular room, I have our writing center materials in a portable tote box. Inside of it we have several alphabet charts, writing paper and decorative scrapbooking paper, a few small boxes of writing tools – pencils, colored pencils, crayons; a dictionary and thesaurus, folders, and a box of stickers. (Stickers are always fun!) I put a large label on the outside of the box so Ellie can get it off the shelf and get everything set up in her place of choice for writing time. 2. Instead of busy work, include fun writing-related activities and crafts. One of my favorite things about homeschooling is how we can tailor lessons to our individual children's needs, desires, and interests. WriteShop Primary offers a lot of different types of activities to enhance what’s being taught in the lesson. 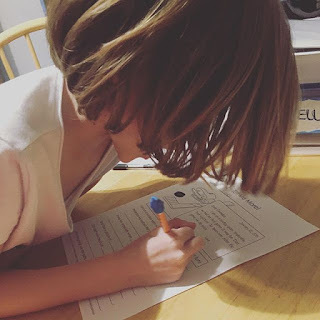 Instead of just editing a letter she's written, Ellie will round up her stuffed animals and use them as “editing buddies.” Or she’ll use a decorated shoebox to create a “family mailbox” to exchange letters with us and her siblings. The variety of different activities reinforce the ideas that she's learning but they're not boring. In Book B of WriteShop Primary, one of the first lessons is on writing a friendly letter. We did the suggested activities and Ellie loved them. We also took the opportunity during this time to visit the post office and mail some letters, check out books at the library about the mail system, and make our own post cards to mail. Adding in different activities outside of our regular school time again reinforced the learning and was fun. One night last week when I went to tuck her in, I noticed that Ellie had a notebook and pencil. I asked what she was doing she and she said she was practicing writing letters - she enjoyed it a lot so that's now become a nightly activity. I don't grade or critique these letters, I just let her write about whatever strikes her fancy and then I read them with her before bed. If she wants to send some (to family or friends) we save them for our school time the next day to edit and then mail! If your child is struggling or just not liking the planned activities or lessons you've chosen for writing, it’s okay to take a detour and try something else. Offer a variety of different craft opportunities and let them choose one: creating their own book with a construction paper cover they can decorate, making a lapbook about a story they've written, designing a diorama, or typing out their story on a computer. Some children who are born storytellers especially like dictation. Since children all have different personalities and styles, WriteShop Primary offers many alternatives throughout its lessons. One of the MOST important things to remember about writing is to keep it fun and enjoyable. If you’re stressed out and frustrated, your child will most likely pick up on that. Include things your child is interested in (blocks, animals, cowboys, a favorite TV show or book) and involve their family members and friends. Resist the urge to correct every little spelling error or handwriting mistake – that’s what editing is for! WriteShop Primary implements all these ideas within its curriculum. If you're looking for a fun homeschool writing curriculum, please check it out! Do you have any other ideas you use to make writing fun in your homeschool? Let me know in the comments!